The Algonquian languages (/ælˈɡɒŋkiən/ or /ælˈɡɒŋkwiən/; also Algonkian) are a subfamily of Native American languages which includes most of the languages in the Algic language family. The name of the Algonquian language family is distinguished from the orthographically similar Algonquin dialect of the indigenous Ojibwe language (Chippewa), which is a senior member of the Algonquian language family. The term "Algonquin" has been suggested to derive from the Maliseet word elakómkwik (pronounced [ɛlæˈɡomoɡwik]), "they are our relatives/allies". A number of Algonquian languages, like many other Native American languages, are now extinct. 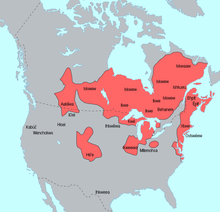 Speakers of Algonquian languages stretch from the east coast of North America to the Rocky Mountains. The proto-language from which all of the languages of the family descend, Proto-Algonquian, was spoken around 2,500 to 3,000 years ago. There is no scholarly consensus about where this language was spoken. This subfamily of around 30 languages is divided into three groups according to geography: Plains, Central, and Eastern Algonquian. Only Eastern Algonquian constitutes a true genetic subgroup. The languages are listed below, following the classifications of Goddard (1996) and Mithun (1999). Extinct languages are marked with †, and endangered languages are noted as such. For dialects and subdialects, consult the separate main articles for each of the three divisions. Eastern Algonquian is a true genetic subgrouping. The Plains Algonquian and the Central Algonquian groups are not genetic groupings but rather areal groupings. However, these areal groups often do share linguistic features, but the sharing is attributed to language contact. Paul Proulx has argued that this traditional view is incorrect,[page needed] and that Central Algonquian (in which he includes the Plains Algonquian languages) is a genetic subgroup, with Eastern Algonquian consisting of several different subgroups. However, this classification scheme has failed to gain acceptance from other specialists in the Algonquian languages. This historical reconstruction accords best with the observed levels of divergence within the family, whereby the most divergent languages are found furthest west (since they constitute the earliest branchings during eastern migration), and the shallowest subgroupings are found furthest to the east (Eastern Algonquian, and arguably Core Central). Goddard also points out that there is clear evidence for pre-historical contact between Eastern Algonquian and Cree-Montagnais, as well as between Cheyenne and Arapaho-Gros Ventre. There has long been especially extensive back-and-forth influence between Cree and Ojibwe. It has been suggested that the "Eastern Great Lakes" languages – what Goddard has called "Core Central", e.g., Ojibwe–Potawatomi, Shawnee, Sauk–Fox–Kickapoo, and Miami-Illinois (but not Cree–Montagnais or Menominee) – may also constitute their own genetic grouping within Algonquian. They share certain intriguing lexical and phonological innovations. However, this theory has not yet been fully fleshed out and is still considered conjectural. Algonquian is sometimes said to have included the extinct Beothuk language of Newfoundland, whose speakers were both in geographic proximity to Algonquian speakers and who share DNA in common with the Algonquian-speaking Miꞌkmaq. Linguistic evidence is scarce and poorly recorded however, and it is unlikely that reliable evidence of a connection can be found. The Algonquian language family is known for its complex polysynthetic morphology and sophisticated verb system. Statements that take many words to say in English can be expressed with a single word. Ex: (Menominee) paehtāwāēwesew "He is heard by higher powers" (paeht- 'hear', -āwāē- 'spirit', -wese- passivizer, -w third-person subject) or (Plains Cree) kāstāhikoyahk "it frightens us". These languages have been extensively studied by Leonard Bloomfield, Ives Goddard, and others. Algonquian nouns have an animate/inanimate contrast: some nouns are classed as animate, while all other nouns are inanimate. There is ongoing debate over whether there is a semantic significance to the categorization of nouns as animate or inanimate, with scholars arguing for it as either a clearly semantic issue, or a purely syntactic issue, along with a variety of arguments in between. More structurally inclined linguistic scholars have argued that since there is no consistent semantic system for determining the animacy of a noun, that it must be a purely linguistic characterization. Anthropological linguists have conversely argued the strong connection between animacy and items viewed as having spiritual importance. Another important distinction involves the contrast between nouns marked as proximate and those marked as obviative. Proximate nouns are those deemed most central or important to the discourse, while obviative nouns are those less important to the discourse. There are personal pronouns which distinguish three persons, two numbers (singular and plural), inclusive and exclusive first person plural, and proximate and obviative third persons. Verbs are divided into four classes: transitive verbs with an animate object (abbreviated "TA"), transitive verbs with an inanimate object ("TI"), intransitive verbs with an animate subject ("AI"), and intransitive verbs with an inanimate subject ("II"). See the lists of words in the Algonquian languages and the list of words of Algonquian origin at Wiktionary, the free dictionary and Wikipedia's sibling project. Because Algonquian languages were some of the first with which Europeans came into contact in North America, the language family has given many words to English. Many eastern and midwestern U.S. states have names of Algonquian origin (Massachusetts, Connecticut, Illinois, Michigan, Wisconsin, etc. ), as do many cities: Milwaukee, Chicago, et al. Ottawa, the capital of Canada, is named after an Algonquian nation, the Odawa people. For a more detailed treatment of geographical names in three Algonquian languages see the external link to the book by Trumbull. ^ Hammarström, Harald; Forkel, Robert; Haspelmath, Martin, eds. (2017). "Algonquian". Glottolog 3.0. Jena, Germany: Max Planck Institute for the Science of Human History. ^ "Algonquian". Dictionary.com. Retrieved 2008-07-07. ^ Campbell 1997, p. 401, notes 133, 136. ^ Bright 2004, p. 32. ^ Goddard 1978, p. 587. ^ Mithun 1999, pp. 328, 333-335. ^ Goddard 1994, p. 187. ^ Goddard 1994, p. 199. ^ Goddard 1979, pp. 106-7. ^ Kuch et al. 2007. ^ Mithun 1999, p. 368. ^ a b Pentland 2006, p. 163. ^ a b Pentland 2006, p. 164. Bloomfield, Leonard (1946). "Algonquian". Linguistic Structures of Native America, ed. Harry Hoijer. Viking Fund Publications in Anthropology: 6. New York. Bright, William (2004). Native American Place Names of the United States. Norman: University of Oklahoma Press. Campbell, Lyle (1997). American Indian languages: The historical linguistics of Native America. New York: Oxford University Press. ISBN 0-19-509427-1. Goddard, Ives (1978). "Central Algonquian Languages". In Trigger, Bruce G. Northeast. Vol. 15 of Handbook of North American Indians, ed. William C. Sturtevant. Washington, D.C.: Smithsonian Institution. pp. 583–587. ISBN 978-0-16-004575-2. ———— (1979a). "Comparative Algonquian". In Lyle Campbell & Marianne Mithun, eds., The Languages of Native North America: Historical and Comparative Assessment, pp. 70–132. Austin: University of Texas Press. ———— (1994). "The West-to-East Cline in Algonquian Dialectology." In William Cowan, ed., Papers of the 25th Algonquian Conference, pp. 187–211. Ottawa: Carleton University. ———— (1996). "Introduction". In Ives Goddard, ed., "Languages". Vol. 17 of William Sturtevant, ed., The Handbook of North American Indians. Washington, D.C.: Smithsonian Institution. Kuch, Melanie (2007). "A preliminary analysis of the DNA and diet of the extinct Beothuk: A systematic approach to ancient human DNA" (PDF). American Journal of Physical Anthropology. 132 (4): 594–604. doi:10.1002/ajpa.20536. PMID 17205549. Archived from the original (PDF) on 2011-07-25. Mithun, Marianne (1999). The languages of Native North America. Cambridge: Cambridge University Press. ISBN 0-521-23228-7 (hbk); ISBN 0-521-29875-X. Moondancer and Strong Woman (2007). A Cultural History of the Native Peoples of Southern New England: Voices from Past and Present. Boulder, Colorado: Bauu Press. ISBN 0-9721349-3-X. O'Brien, Frank Waabu (2010). "Understanding Indian Place Names in Southern New England". Boulder, Colorado: Bauu Press. ISBN 978-0-9820467-6-0. Pentland, David H. (2006). "Algonquian and Ritwan Languages", in Keith Brown, ed., Encyclopedia of Languages and Linguistics (2nd ed. ), pp. 161–6. Amsterdam: Elsevier. Proulx, Paul (2003). "The Evidence on Algonquian Genetic Grouping: A Matter of Relative Chronology", Anthropological Linguistics 45:201-25.